Story of Bhagavan Sri Krishna rescuing son of Guru Sandipani from demon Panchajana is found in the Srimad Bhagavad Purana. Guru of Sri Krishna was Saint Sandipani. 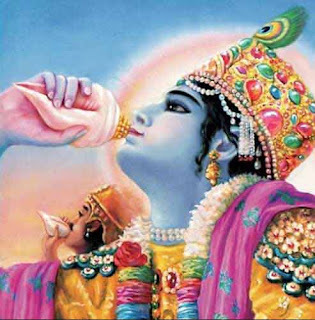 After the completion of his education, Lord Krishna wanted to offer a Guru Dakshina. As Guru Dakshina Guru Sandipani asked Lord Krishna to find his lost son. After searching for a while, Lord Krishna found out that the Guru’s son was captured and abducted by a demon named Panchajana. The demon lived under the sea in the form a conch shell. Krishna soon entered into a fight with the demon and killed him. He rescued the son of Saint Sandipani and took the conch shell. The conch, Panchajanya, is named after this demon.